Even today, I regularly hear from Marvin about his work with the Muslims in Tawi-tawi in Mindanao. His sponsors, Glenn and Linda Gately, continue to support Marvin’s work for our Lord. They have sent funds for audio – visual materials, etc., and renovated a church there, and also support a layman to help Marvin. Here are some of Marvin’s report in the past 2 years. Greetings from Tawi-Tawi! We just finished the SAMA Youth Camp held at Sangay Island. This was participated by 96 campers, 30 children, 14 Sulads-missionaries, parents and brethren. A total of approximately 200 individuals. Of the 96 campers, 3 only are Christian Adventists and 20 are Muslim Adventists. The rest are pure Muslims. Their feedback was amazing. They really enjoyed even though they used mosquito nets as their tent. It was the first camping ever in their whole life. Greetings from Tawi-Tawi Islands! It’s our special worker’s meeting today at Ipil, Zamboanga Sibugay so I got the chance to e-mail you. We have lots of activities this quarter. We have an ongoing church construction at Tongusong, Simunol, Tawi-Tawi. This church is mostly made of wood. It is built above the water. Hopefully it will be finished by April. We conducted a medical outreach at Badjao Village, Bongao, Tawi-Tawi targeting the very poor community known as “Badjao.” Our medical team were composed of 6 volunteer local doctors, 2 dentists, 12 nurses and military men who assisted us. Most of our team are non-Adventist. We had served a total of 777 Badjaos (Medical – 635, Dental – 86, Circumcision – 23, haircut – 33). Greetings from Tawi-Tawi! 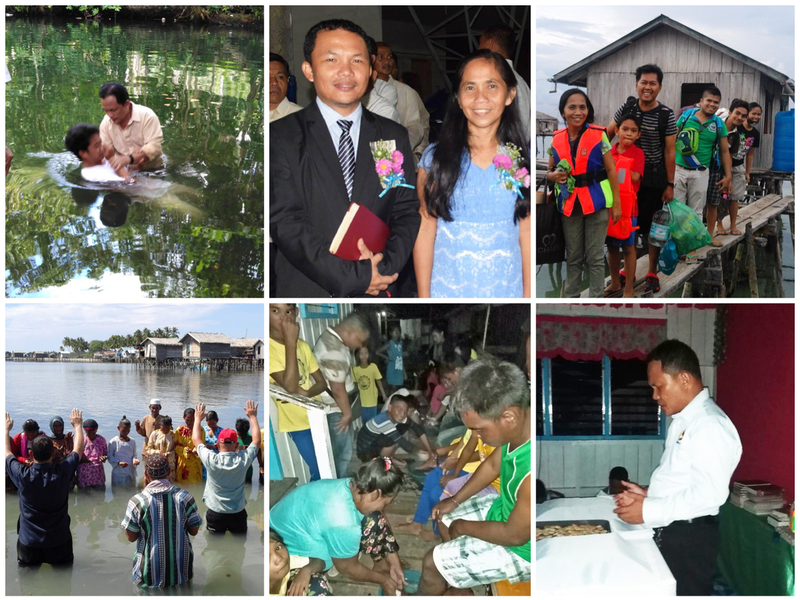 We have a target of 4 evangelistic efforts this year. One that will start this May is in the Badjao village where we conducted the medical outreach. 2nd is in our home church -Bongao Adventist Center, 3rd is at Bongao Seventh Day Adventist Church and the last one is at Bato-Bato or Languyan. This 1st week of April is our Vacation Bible School at Simunol Island. Teachers from Bongao Adventist Elementary School will conduct it. I am privileged to join the medical team at Mapun and Taganak Islands last April 11-14, 2017. The medical team is a collaboration of Adventist doctors and nurses, and military men of Special Action Force, 2nd Marine Battalion and Navy. 2 medical doctor and 3 dentists, plus 6 nurses and 2 medical technologists. It was a humbling experience when I again visited Mapun – my first assignment during my adopt-a-minister years. The medical team served a total of 660 patients, dental -240, blood sugar – 386, circumcision – 66. The highlight of the medical mission is the baptism of 5 precious souls at the famous 2nd Lake in Mapun. It was with mixed emotions as I baptized one of the five named Nanay Lumen. I gave her bible studies while I was a missionary way back in 2000. Praise the Lord! Greetings from Tawi-Tawi! To God be the glory! Nine precious Sama Muslim Souls were baptized by Pastor Pitogo, SPUC Sulads director during the culmination of Sama Youth Camp with more than 200 attendees. Laa Island, once a notable Pirate Island, opened its doors to the gospel message. Along with the camping, we conducted Happy family Life & AMR seminar with the Tausog Muslim island dwellers. For 1 week starting Nov 26-Dec2, about 400 Tausog (parents & children) came and listened to the lectures. We stood in awe knowing that the Tausogs are hard to convert. God is opening doors to the Muslims tribes. Christ is coming very soon. Please pray for next year’s target- the first mosque in the Philippines located at Simunol Island. Greetings from Tawi-Tawi! God is first for this year 2019. Our district joined the 10 days of prayer. Just this Sabbath for our Sama Muslim Fellowship at Lomboy, I conducted the first-ever communion for the Sama Muslim brethren. Praise be to God who made us workers for His vineyard! Our fellowship at Tubig-Indangan, Simunol was concluded with a baptism of 2 precious Muslim SAMA. Thanks to the efforts of our Sama layman in the person of Simpson Misuari that in spite of the present religious threat to our work there, God has opened the window.